Such is the state of justice in Haiti, where on January 30th Carvès Jean, an investigative magistrate, dismissed charges of grave human-rights crimes against Mr Duvalier, including torture and political assassination, because a ten-year statute of limitations had expired. Mr Duvalier ruled the country from 1971 to 1986, when he fled to France and spent 25 years living off the millions of dollars he is frequently accused of having siphoned from the public treasury. Mr Jean ruled that a trial for misappropriation of government funds could go forward, though it will be heard by a tribunal that handles relatively minor crimes. The maximum penalty would be five years in prison. The UN and human-rights groups raised an immediate outcry. Human-rights crimes during Mr Duvalier’s regime are amply documented, and under international law, they argue, there is no statute of limitations on crimes against humanity. 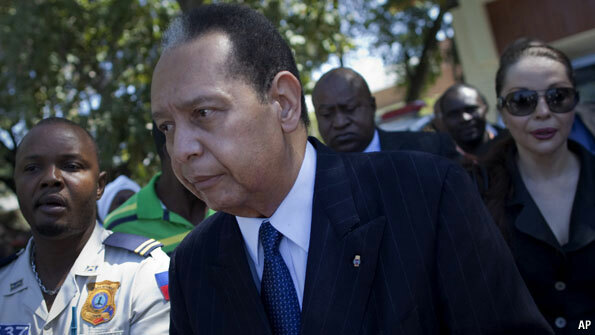 “Courts from Argentina to Cambodia have set aside time limits to address past atrocities, but once again, Haiti is an exception,” said Reed Brody of Human Rights Watch, which helped build the case against Mr Duvalier last year. Amnesty International called the investigation a “sham” and the ruling a “disgrace.” Mr Jean was accused of failing to investigate the claims of at least eight of the 20 complainants in the case. 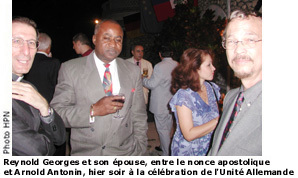 Mr Duvalier, nicknamed “Baby Doc,” made a surprise return to Haiti in January 2011. He was arraigned a few days later and put under house arrest—an order he repeatedly violated by swilling Champagne at fashionable restaurants, venturing out to the countryside and even addressing a law school graduation in Gonaïves, where the uprising against him started 26 years ago. (“You have chosen a noble discipline,” Mr Duvalier told the graduates, one that “restrains and channels the selfish instincts and eternal brutality of men.”) When called into court, Mr Duvalier tended to take ill, supplying the court with a note from his doctor. Mr Jean eventually lifted the house-arrest order as well. When asked about the Duvalier prosecution, Michel Martelly, the president, has repeatedly invoked the separation of powers, saying the case was a matter for the Haitian courts, not the executive branch. However, he has been ostentatiously gracious toward Mr Duvalier. Last month Mr Martelly invited the former dictator to a two-year commemoration of the 2010 earthquake at a mass-grave site. Later, he said he would consider pardoning Mr Duvalier. He backtracked a few days before Mr Carvès handed down his order, full of typographical errors. The complainants said they would appeal the decision. So did Mr Duvalier’s lawyer, Reynald Georges, who announced that his client would appeal the corruption charges. Last year Mr Georges received your correspondent in his office with an automatic weapon on his desk, answered some questions, and then invited her to sit on his lap. She made a hasty exit. Copyright © The Economist Newspaper Limited 2012. Published by The Economist Magazine, Friday, January 4, 2012.